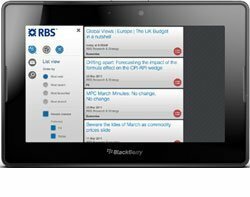 The Royal Bank of Scotland's (RBS) investment arm has launched a mobile application for Research in Motion (RIM)'s Blackberry Playbook tablet device. The RBSMarketplace Blackberry Playbook app provides offline access to the bank's research and strategy reports and analysis on fixed income and currencies and commodities (FICC) markets. Other investment banks - such as Barclays Capital, Citi, JP Morgan and UBS - have started distributing research content via Apple iPad applications. RBS also launched an Apple iPad app in March 2011. But Colin Jowers, global COO for research and strategy at RBS, says it made sense to develop an application for the Blackberry Playbook, saying it was an integral part of the market. Earlier this year, research firm Gartner predicted 80% of businesses will support its workforce using tablet devices, such as the Apple iPad, by 2013. According to Deloitte, companies will purchase 10 million tablet devices in 2011, comprising 25% of all tablet sales. "Successful banks in this space will deliver content optimised for client use on their preferred devices. Mobile access to a website will not be enough," says Colin Jowers. Jowers notes that, as someone who signs off operational costs, tablet purchases are increasing while laptop purchases are decreasing. However Jowers adds that the deployment of tablet devices is still being debated in RBS while the return on investment (ROI) is considered. RBS had seven weeks to develop and launch the app to meet Research in Motion (RIM)'s UK launch deadline. This meant RBS had to release certain app features in separate phases, such as its "Trend View" feature, which will be launched next week and adds to the US version of the app. Trend View stores data in RBS's content management system (CMS). Trend View took longer because algorithms had to be written to analyse clients' reading habits so research content could be rated in elegance and popularity. Ron Karpovich, RBS's managing director for electronic markets and project management for the app development, says RBS's team included five mobile app developers, two designers and a larger team of up to 15 people. Karpovich says the developers used HTML5 and APIs, which made the process of creating native apps easier. But he said finding IT staff with the right skills in HTML5 and APIs was difficult. HTML5 apps can be used on any device, regardless of its operating system, if a native container or application wrapper is built. Various frameworks and open source platforms for developing HTML5, such as PhoneGap, allow developers to create cross-platform apps more easily. "But not many developers can do HTML5 so we had to provide training," Ron Karpovich says. Both RBS's Apple iPad and Blackberry Playbook app also use the same content and API - built in-house - to distribute content to devices. Karpovich adds that one of the main challenges was testing the application before a prototype device was available. Testers had to use a desktop simulation of the multi-touch gestures. "Because we were missing the device, we couldn't test the finger swiping," says Karpovich. "It came out better than the simulation," he adds. Karpovich plans to consolidate the apps across other mobile platforms and is currently working on an app for Google's Android OS. He adds that RBS is also considering how to provide video as part of the research and strategy content. "There's a debate about how to do that cheaply," says Karpovich. The app is free to download for RBSMarketplace registered users.